BAR BAR Black Sheep is sick of giving people three bags full of wool every time they come around to visit. Click here to play! That little boy who lives down the way in particular can just... Well, you can guess that BAR BAR Black Sheep has had it up to his floppy ears with the little boy down the way. A bigger operation is required, one that relies less on a single black sheep and more on three white wool producing sheep. BAR BAR Black Sheep isn't so good with the wool collection, however, and he needs your help. A lack of hands that can grip makes shearing and transportation of the wool somewhat difficult for a sheep. If you can help BAR BAR Black Sheep to get his wool operation off the ground, then he may even make you a partner some day. In the BAR BAR Black Sheep slots, you can win by lining up three matching symbols on a payline, or by getting two BAR symbols followed by the Black Sheep. 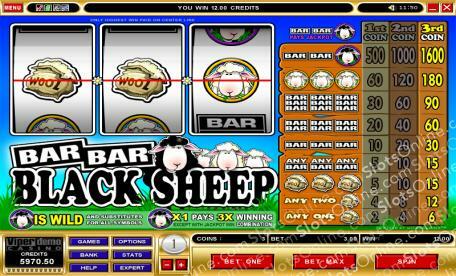 The more coins you bet, the bigger the jackpots you can win in the BAR BAR Black Sheep slots. The Black Sheep symbol is wild, and triples the payouts of winning lines, except when matched with single bar symbols. When two BAR symbols are paired with the Black Sheep, the player wins the jackpot.